The Grateful Dead’s 1972 tour of Europe is legendary. The band’s prior jaunts across the Atlantic had been quick ones, but this undertaking was a working vacation that found the group taking a leisurely stroll across the continent, absorbing the sites, and turning in a series of epic performances. It’s no wonder, then, that Steppin’ Out with the Grateful Dead marks the third collection of material from this two-month affair. The first was Europe ’72, a polished, but powerful album that many purists decry for its studio overdubs. The second was the two-disc compilation Hundred Year Hall, which these same purists argue is less than satisfactory simply because it doesn’t contain a complete show. (For the record, both of these albums are exquisite representations of the Grateful Dead at its finest, and passing them by most certainly would be an unfortunate decision). Nevertheless, for the definitive Europe ’72 recording, one need look no further than the recently released Steppin’ Out with the Grateful Dead. This four-disc package compiles music from seven of the Grateful Dead’s eight concerts in England, fusing the fragments together to form a rather cohesive collection of monumental proportions. No doubt, the purists are crying foul once again, but either taken as a single mammoth show or four individual sets, Steppin’ Out succeeds brilliantly. All one needs to do is sit back and listen. Pigpen fans, in particular, will have a blast pouring through the music on Steppin’ Out. Though he was thin and frail — this was his final tour — one wouldn’t have known it from the power of his performances on this set of songs. Indeed, where Bear’s Choice felt flat in its tribute to the Grateful Dead’s first keyboardist, Steppin’ Out radiantly shines. Good Lovin’, Turn on Your Lovelight, and Caution (Do Not Stop on Tracks) all basked in the sparkly glow of Pigpen’s improvisational raps. And, his wordy rants only served to egg on the band, pushing the group further outward into its own unique brand of blissful space. If Pigpen’s passionate vocals were the jet fuel, Jerry Garcia’s guitar was the rocket ship, blasting straight through the center of each song’s heart with inexorable incandescence. In early 1972, there was something different in the air as well. The Grateful Dead had already shifted from jug music to blues to folksy Americana, but it was about to embark in a new, jazzier direction. Part of this transformation was due to Pigpen’s failing health, which prompted the addition of keyboardist Keith Godchaux and his vocalist wife Donna. Then again, this broadening of style could hardly be called a surprise, given Garcia had long been infatuated with the music of John Coltrane and later Miles Davis. As Dark Star began to take on a slower, more deliberate, jazz-fusion pace — like the version reproduced on Steppin’ Out — it blossomed with even more potential than the rapid-speed early renditions. Though this metamorphosis would not be complete for another year, the seeds had been planted: Goin’ Down the Road Feelin’ Bad embraced a looser, freer groove, the pairing of China Cat Sunflower and I Know You Rider swung mightily, and Playin’ in the Band thrived in a more open-ended setting. In addition, the members of the Grateful Dead were in the midst of their most prolific period of songwriting. Tunes such as One More Saturday Night, Jack Straw, Ramble On Rose, and Comes a Time had all found their way into the band’s sets just a few months earlier, but it was the tour of Europe in 1972 that put them in perspective and allowed them to come into their own. And there were plenty of relatively old favorites, too. Songs such as Truckin’, The Other One, Sugar Magnolia, and Uncle John’s Band had begun to take on fresh shapes and sizes, moving into a myriad of new directions — sometimes all at once. For this reason, the Grateful Dead’s concerts from 1972 through 1974 are what many consider to be the band at its best. Though it delivered many outstanding performances both before and after this period, the group was never so consistent, its sets never so diverse, its music never so exploratory. 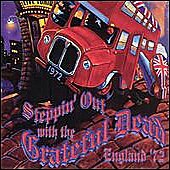 The 1972 European tour may have only been the beginning of this new endeavor, but while listening to Steppin’ Out with the Grateful Dead, it’s hard to imagine any collection of material to be any better at encompassing what the band was all about. from iTunes. To order, Click Here!